Made from the finest meat and freshest spices, the Cajun favorite has a smoky aroma and a spicy, vibrant taste that is as good as it gets in Louisiana or anywhere. This Italian Sausage has a slightly sweet and tart flavor resulting from just the right amount of fennel. This fully cooked, smoked, robust, spicy pork sausage is great on pizza or for grilling. 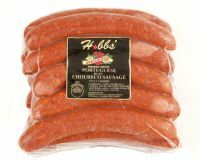 A distinctive smoked and fully cooked sausage from carefully selected prime cuts of fresh pork which have been diced to a medium texture. The exclusive combinations of rich, natural seasoning and subtle blend of peppers make this old world sausage delightfully tasty. An exquisite French Sausage made with seasoned pork, and packed into a natural casing. It's a great sausage for a cassoulet (white bean casserole). From the same select pork as Hobbs’ premium bacon in a natural casing! Made with all natural ingredients including apples and a special blend of spices. Fresh, nitrite free in sheep casing. Hobbs’ began making this true foot-long 12” Hot Dog to fulfill a special request from famous Chef Bradley Ogden.